Thanks so much for all of the kind comments on my first upholstery piece! But I think it turned out better than I had hoped for a first project! Years ago, when I was a newlywed, I was working at a very large fabric store in Portland. Periodically, they would offer upholstery classes. They always filled up fast, were very expensive, and they required you to have a lot of the (expensive) tools prior to class. I always hoped maybe someday I could take one, but I never did. Heck, I was eating microwave popcorn for lunch back then, because that's all I could afford! I learned how to undertake this project from reading up on several other tutorials around the blog world, so now I am paying it forward. I referenced this blog and this one primarily for my "lessons". First off, I didn't use a lot of fancy expensive tools. You probably have all these tools too. 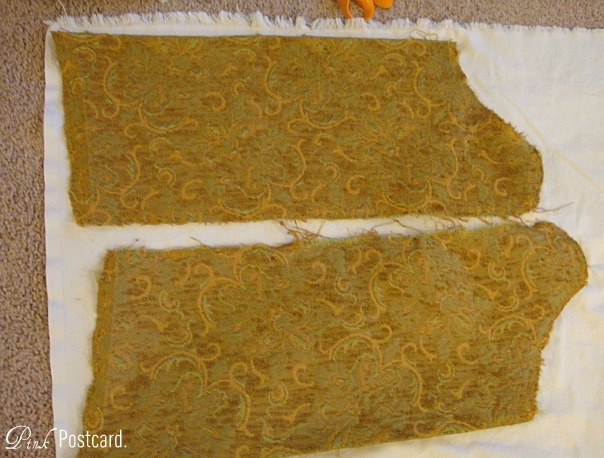 Remove all of the trim and fabric. I used my needle nose pliers and hands. This is not for someone who is worried about messing up a manicure. Your hands will be very sore when you're done and you might even get a couple blisters. I did. 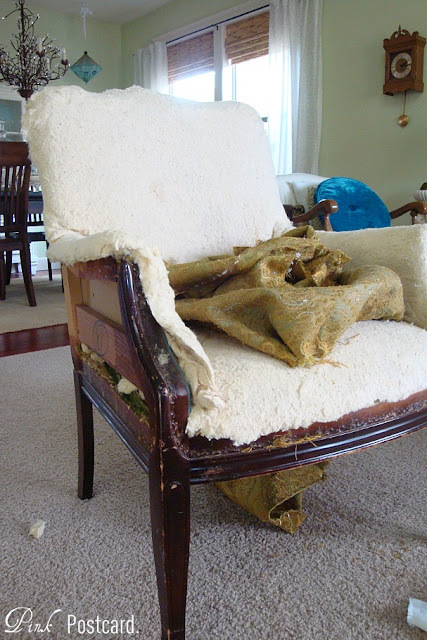 The batting on the chair was in really good shape and stayed put during the deconstruct phase, and I kept it. I also kept any nail head trim that wasn't too wonky from pulling out and reused those around the burlap. Make sure all the staples, nails and sharp stuff has been removed from the frame. 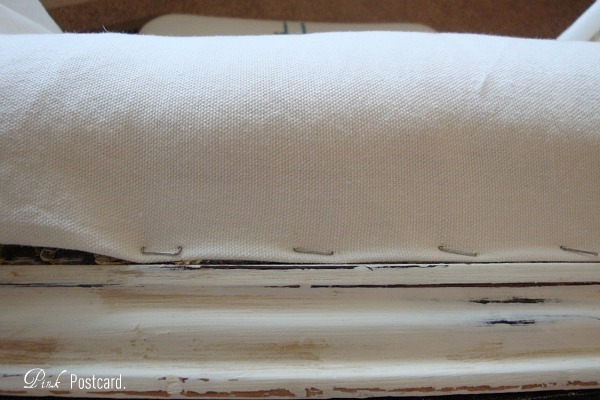 If you plan on painting the frame or wood, do it now before the fabric goes back on. I also wanted something interesting on the chair- so I painted stripes and the numbers on the seat back using this method. Once the paint and finish is dry, you can start putting the new fabric back onto the chair. 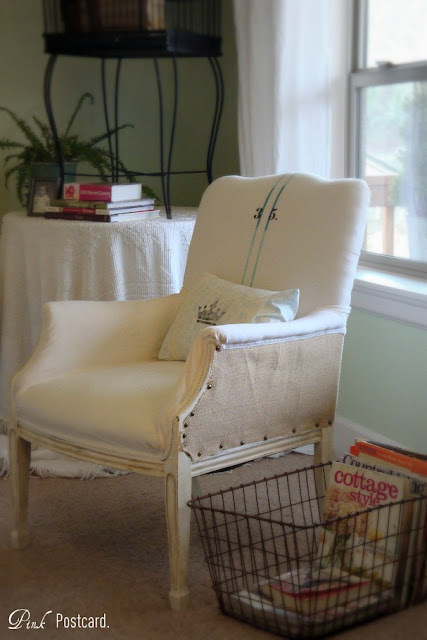 I started with the front back of the chair, burlap sides, then the seat, the arms, and finally the back of the chair. 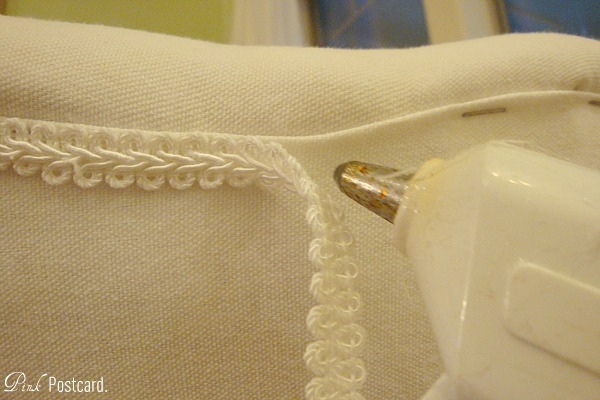 Lay each piece of fabric where it is going and adjust and smooth it out before you start tucking. 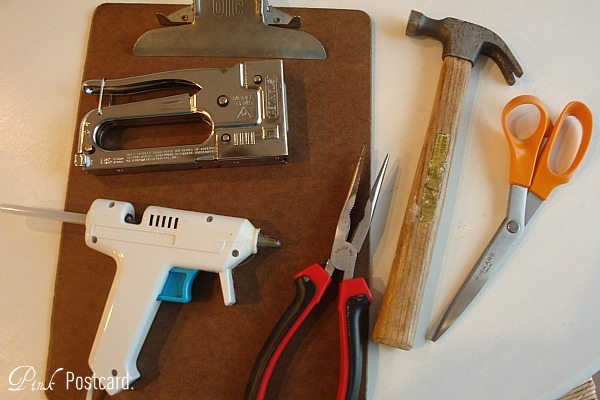 Once it is in place, you can use your staple gun to secure it to the frame. 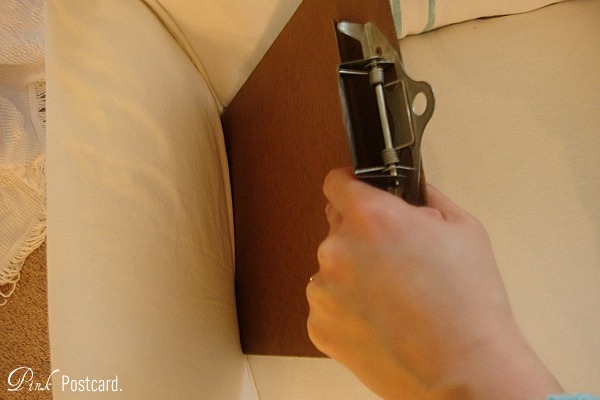 Your staples will get covered with trim, but make sure they are somewhat close to the edge so they will be hidden. 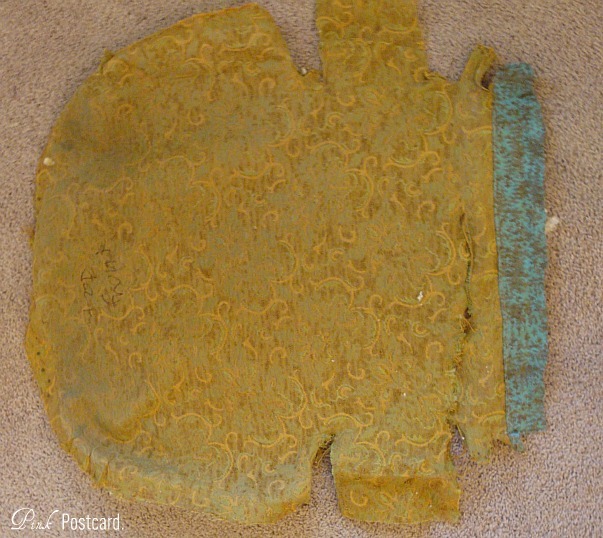 It was tough to tuck in the fabric in some spots, so I used a wood clipboard to help dig it in. Hey, sometimes you gotta use what you have on hand. It was easier than trying to get my fingers in there, very sturdy, and thin enough without poking holes into the fabric. Key words here: pull, smooth, tuck. 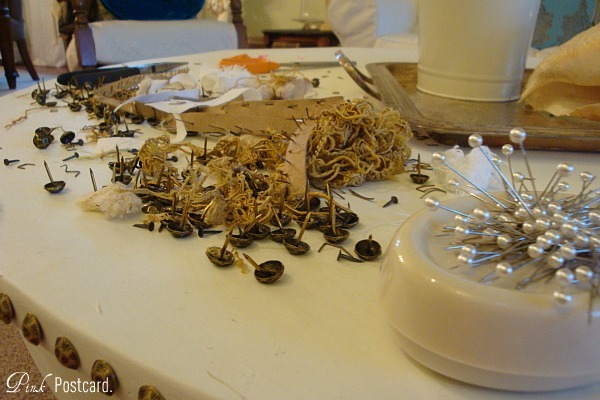 Once all your pieces are stapled firmly in place, you will need to hide all the staples and rough edges. I used white trim, a la Miss Mustard Seed. Using my sewing measuring tape, I measured how many yards I would need to cover up everything. A hot glue gun is the only tool I used. Try to avoid connecting together smaller pieces. If you do have an end point in the middle somewhere, fold the end of the trim over, add a dab of glue and smoosh it in as close as you can to the other end piece. That other end should also be folded under! No frayed ends! 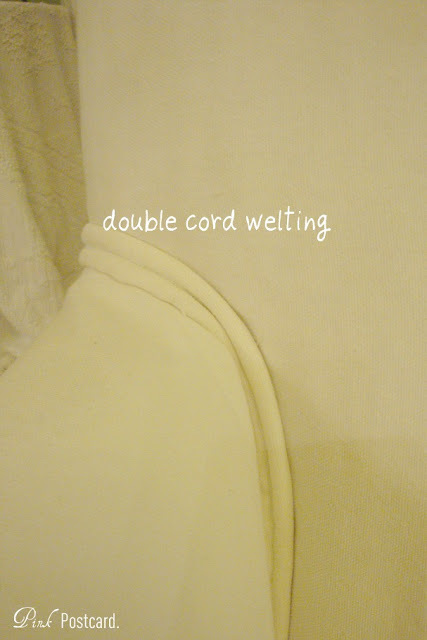 For the inner arm sections, I made double cord welting. Centsational Girl's tutorial was very informative, and I won't attempt to rewrite what she already did so well. It's pretty easy! I'm not sure if this is technically the "right way" to finish off the arms, but it works for me, and looks a lot more finished than the folds and tucks that were there before. Some more hot glue and tucking, and it was good to go. I hope this makes sense, and takes some of the intimidation factor out of upholstery! The chair I used was a $15 thrift shop find. It was well constructed, and had simple lines. Not a family heirloom or a buddies project that I would feel sick about if something went horribly wrong. Same thing for the fabric. $9.99 white cotton duck fabric. I think I even used a coupon, so it was less than that. The burlap was extra I had on hand from other projects, and as I said before, I reused the nail head trim when possible. The white trim was .99 cents a yard, and I used a little over 3 yards to cover the staples. Inexpensive, but good quality fabric. ASCP in Pure White was what I painted the legs with. Dark and light waxes for an aged look, and a bit of sanding on the edges. The best thing you can do to get a smooth finish is to gently, but firmly, pull and smooth as you go. Great tutorial. Thanks for sharing. Love the way it turned out. 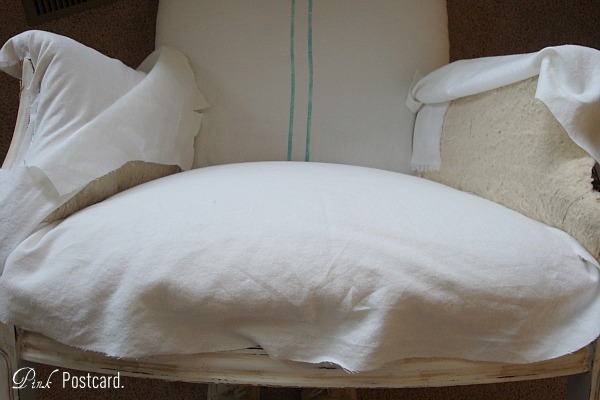 What made you decide to use the burlap on the sides? I like burlap but wouldn't have thought to use it there. The chair looks great! 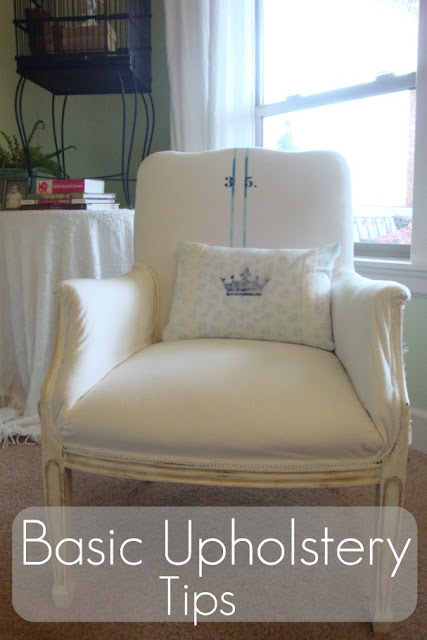 I have two antique chairs I got at a great price at an antique store that need to be recovered. I don't know if I want to try it myself or have it done. I'm a chicken! Ok Denise, I'm saving this! I promise to give it a try! Denise, This is amazing! What a lovely chair! You made it look so easy! Great job! Hi Denise, just found you through Country Living's fb page. You did a fabulous job! 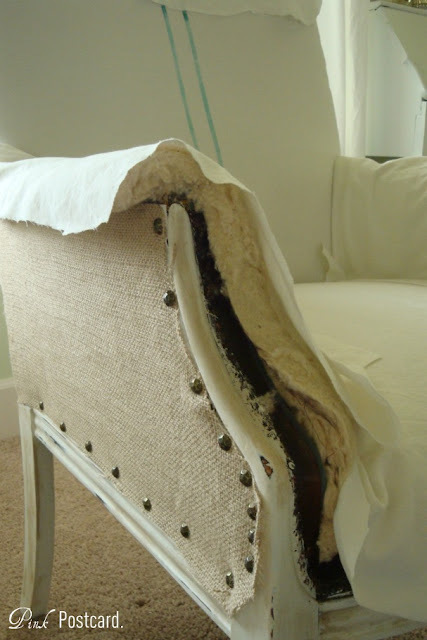 Upholstery scares me but this has motivated me to try! Have a wonderful weekend. thanks for the tips I'm doing a chase this weekend! You did an amazing job. It's beautiful! That turned out fantastic, and I love the painted portion of it. Lovely!! your step by step instructions are wonderful! You do a greg job!! I have a settee that has been waiting for me to get to it...I'm gonna pin this and give it a whirl! THANKS! Great tutorial, Denise! I can't wait to give it a try! 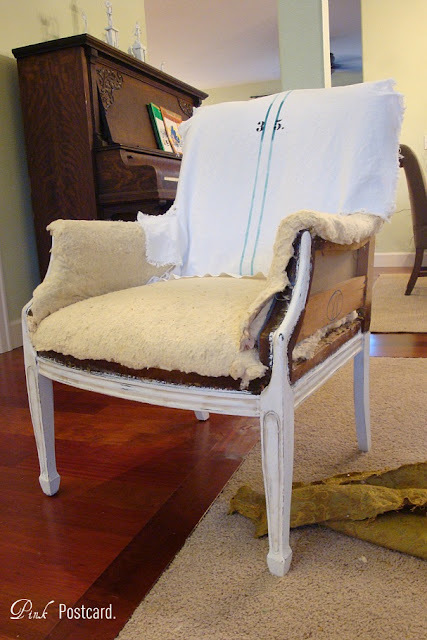 I'll be on the lookout for thrifty little chair for my first attempt ;) I always assumed I would need expensive tools, and an industrial strength sewing machine to tackle an upholstery project! Thanks for all of the great tips! You nailed (or should I say stapled ;) this one! Denise, you did a great job, this is something i want to tackle when I have a bit more time!! Thank you for the links and tutorial! Love it! and your bedskirt looks great too! :) happy friday! Woot! I love the way you mixed fabrics. For me the hardest part was taking out the rusty old staples.